Since April of 2008, I have been a blogger. My first site, Day by Day in Our World, began as an online journal and quickly morphed into something more. Product reviews transitioned into more paid sponsored content. And, along the way, I joined a few different affiliate programs for products and services our family truly loved. 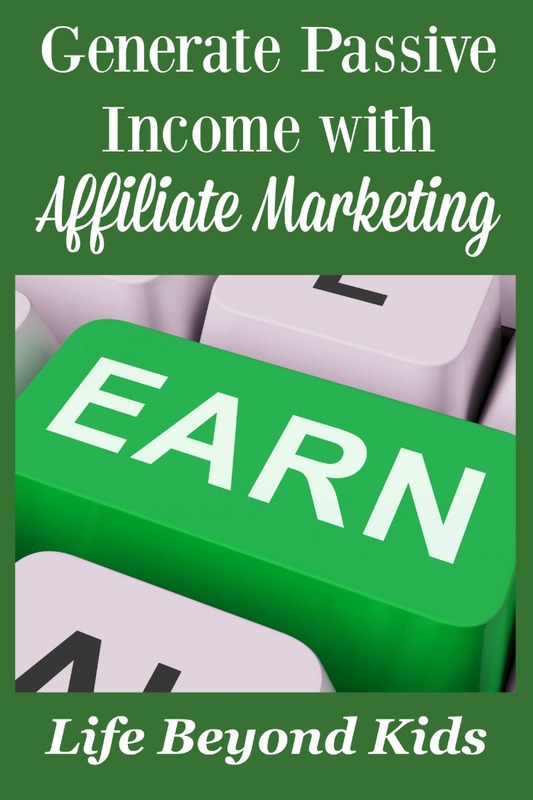 What many of us in the blogging community long for is a way to earn money ‘while we sleep.’ Specifically, we want to know how to generate passive income with affiliate marketing. Note ~ I will be linking to examples here and forewarn you that affiliate links WILL be included. After all, what is a post about affiliate marketing without affiliate links? Clicking on the links and making a purchase or joining a program costs you nothing. Thank you in advance should you choose to purchase something or sign up through them! Before going into HOW you can earn passive income through affiliate marketing, I thought it might be helpful to define what affiliate marketing is and what it is not. If I had to define affiliate marketing to someone unfamiliar with it, I would say that it is when a brand offering a product or service partners with an individual to help market their offerings in exchange for a commission. Do you remember the Faberge shampoo commercial from the 1980s? One lover of Faberge hair products told one friend who then tells a friend, who tells a friend until word has spread to dozens, hundreds, and thousands of people from ONE person sharing. Whether you call it word of mouth marketing, social network marketing or viral marketing, the idea is the same. One person shares to others who then may share to further exposure of a brand. What is different in affiliate marketing is that beyond name recognition, the initial sharer (the affiliate) is hoping people will use their link to make a purchase which earns them that commission. The commission is a way for the company to repay the affiliate for sharing about their product or services. Of course, if you continually share without making any sales, then the company is, in essence, getting a ton of free advertising while you have nothing in hand. The ONLY difference is that the affiliate, who’s link you clicked on to reach the product, will see a commission for the sale. How much they see is based on their agreement with the merchant. And if it is Amazon, then it is also dependent upon Amazon’s algorithm not seeing the purchaser as a close friend or family members. The process of becoming an affiliate is pretty much the same for any affiliate program out there. You sign up with a company to be an affiliate. Depending upon the platform, you may need a website (like a blog) or you may be able to leverage just your social media channels. Once you are approved (some are instant and others actually want to vet your site and social media channels), you are given a unique code and access to resources to help you be an affiliate with them. Those resources could be as simple as a generic link to their site to more elaborate with suggested copy for an email campaign, blog post, or social media sharing. Images may be specially generated for affiliates or they may give permission to grab images from their website. The KEY for any of that is really looking at your dashboard and understanding terms of service. Some companies have their own affiliate program hosted on their website. Many of them are smaller entities and they are comfortable with self-hosting the program on their website. Apologia and Build a Menu are examples of companies which do this. Of course, Amazon is an example of a HUGE company that hosts their affiliate program on their own website. Other companies elect to use a service like Share a Sale, CJ Affiliate (formerly Commission Junction), or Rakuten Affiliate Network. These networks are like a HUGE clearing house of companies with something for just about anyone. Some affiliate programs will offer you a commission just for bringing them a new affiliate, like Madison Reed which sells some awesome hair coloring products (review coming soon!) And others, like Grammarly will often offer a small payout to your account just for doing a blog post about them. To be an affiliate, you really need to understand the regulations for your state as well as the program. Some places (i.e. Vermont and Missouri) are considered NEXUS states and programs like Amazon will NOT let you sign up if that is where you reside and hold your place of business. NEXUS is all tied to the collection of sales tax in a state where a physical presence does not exist. The other thing to understand is the nature of each affiliate program for what needs to happen to remain an affiliate. I’ve not had any luck with CJ Affiliate with generating sales and they will put you on a dormant status after 180 days of no sales. You can log in and request reactivation, though. Share a Sale has been WAY more generous as I sat with no active sales for more than a year without being deactivated or placed into dormancy. As for getting paid, each affiliate program or network has its own threshold for payouts as well as HOW you receive your commission. Some of the affiliate programs run by bloggers will pay via Paypal as you earn or on a monthly basis. Amazon has a low payout threshold ($10) with the option to either receive an Amazon gift card or direct deposit. Most of the networks have payout thresholds that are larger ($50 or more for some) with the expectation you are able to reach it by representing multiple brands. This brings us to the crux of the article: How To Generate Passive Income with Affiliate Marketing. Making money in our sleep…that’s the dream of most online entrepreneurs. And, for some, affiliate marketing is how they are able to achieve it. The process is simple. Basically, you take those affiliate links you’ve received for the products and services you want to promote and embed them into content. The more authentic and engaging the content, the more likely you will see people wanting to purchase through your links. If you are presenting a problem they have and offering a solution to that problem, then you are more likely to see them click through and potentially buy the product or service. The nature of the internet is as such that a post written tomorrow might not start showing up on a Google search for a while. Initial traffic to the post comes from readers coming to your site for new content and your own push of the post through social media channels. It is only a bit later when you may start to see visitors coming via a search. Anyone with an older website who tracks their analytics recognizes that there are evergreen posts still seeing traffic from those searches months and years after the post went live. There are many factors which go into both how people will find your post as well as how appealing they will find your particular post. If the proposed solution is interesting to the reader, then they may click on a link to see more about it. If what they see fits with what you presented, then they may opt to purchase it. When it comes to SEO of your post and visually appealing graphics to entice readers to click over and make a purchase, the process of affiliate marketing can be a bit confusing. Thankfully, there are classes available to help you be educated in what you need to know. 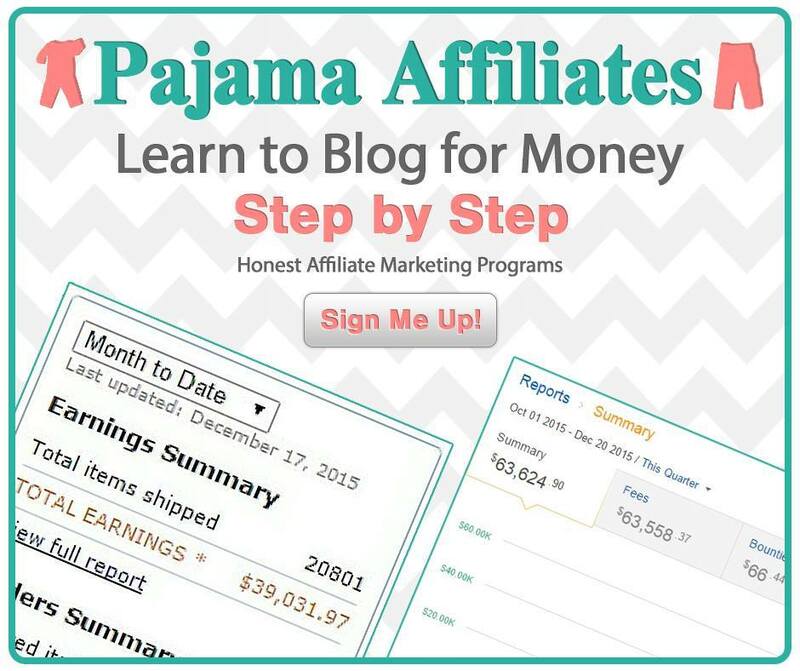 My personal favorite source for affiliate marketing education is the Pajama Affiliates. They offer a Step by Step Blogging Course which walks you through the entire process from starting a blog to monetizing it. This course includes the smaller add-ons of Building a WordPress Site in a Day (totally worth it!!) and How to Find Your Niche. If you are quite comfortable with the basics of blogging, there is a more advanced Blogging and Affiliate Marketing Masterclass. 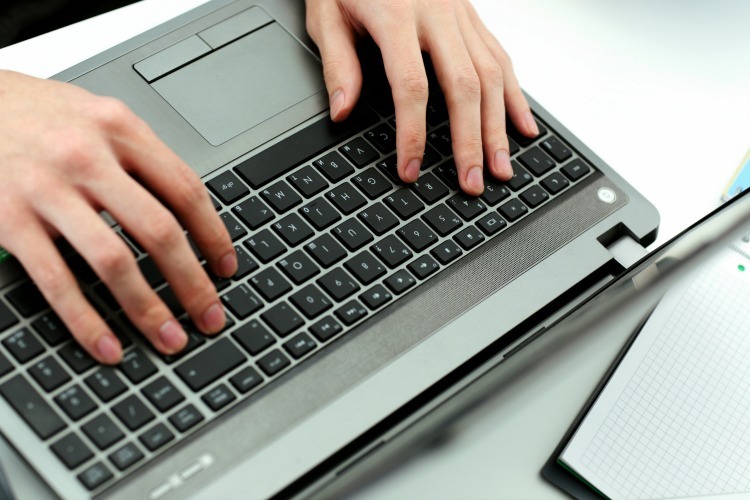 Buyer Keywords Bonus and How to Write a Blog Post that Converts Sales have the 2 ladies who own and operate the site walking you through crucial steps. For those that want it all, then the Business Bundle has you covered. Over time, I have purchased the different pieces to now have the whole sha-bang. For those who are skeptical about what Pajama Affiliates has to offer, then take advantage of their incredible $1 Fast Pass Class which has parts of the classes available to you for viewing. It is the ultimate try before you buy! If there is something I have learned from working my way through the classes of Pajama Affiliates, it is that perseverance will pay dividends. Contrary to advertisements, you will not be able to earn six figures in a few months. However, putting in a bit of hard work now can get you to that point of generating a passive income through affiliate marketing. Affiliate marketing is where you share about a product or service for a brand you like and earn a commission of any sales you generate. Each program is different, so READ the rules and make sure you are not spamming your readers or social media networks with affiliate links. Do you use affiliate marketing to monetize a website or via your social media channels?